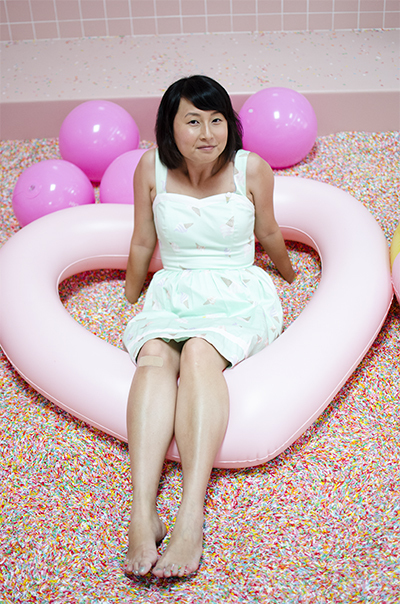 When I heard the Museum of Ice Cream was coming to Los Angeles, I knew I HAD to go. I bought tickets the second they went on sale, to go with some good friends on my birthday in May. But then my husband got tickets for the opening day! Since he’s out of town during my birthday, he got tickets for just us to go. And after going through it, I am definitely happy to go see it again with my friends. 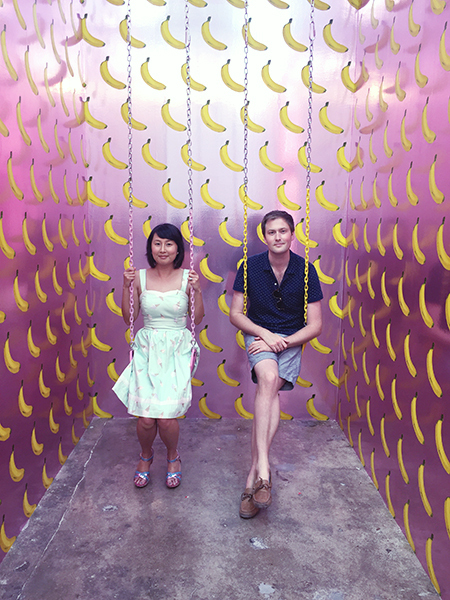 The Museum of Ice Cream is totally Instagram bait, with all the pink and other bright pastel colors. 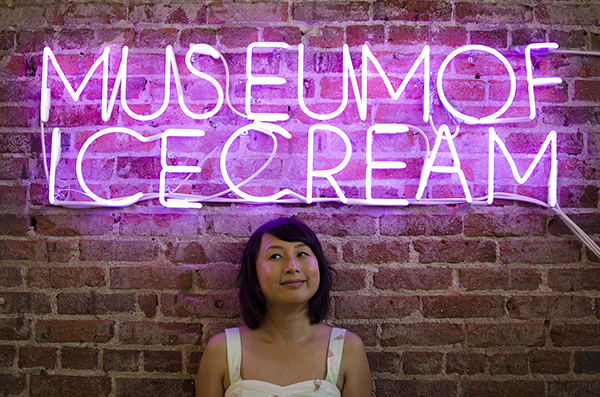 It’s not really an educational or historical museum; it’s more like a set up of various ice cream-themed art installations. So don’t expect to learn about the history of ice cream or the science behind making frozen treats. 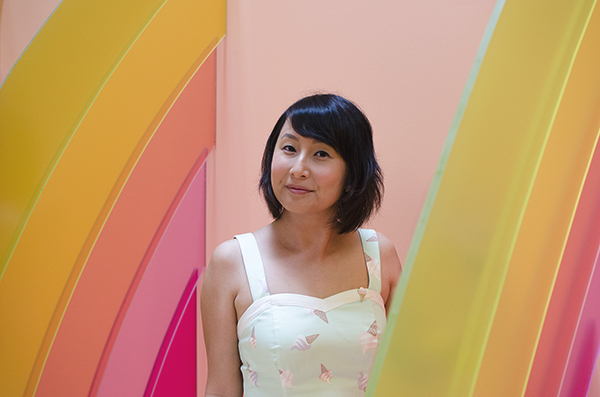 There’s the ubiquitous “millennial pink,” but it fits with the nostalgic, whimsical feeling of the museum. There were several themed rooms but I didn’t feel rushed at all to go through them. The museum lets you spend as much time as you like in each room (except the sprinkle room, which has a time limit). Many of the rooms have some sort of ice cream sample or sweet treat to try, which is a nice bonus. I totally need this sign, as I have so many mint colored clothing items. artwork by Abel Bentin. Each cone is unique! The famous rainbow sprinkle pool! 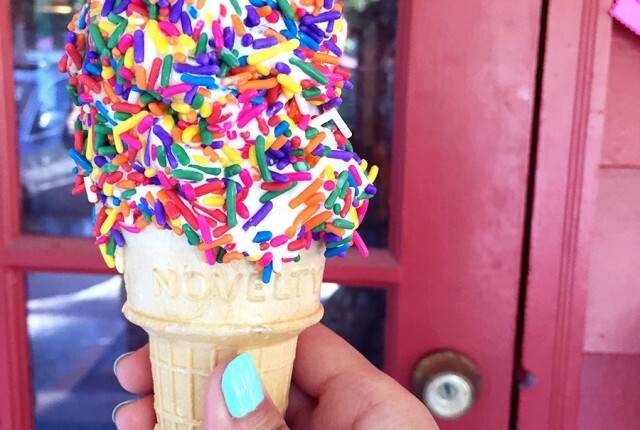 An explosion of sprinkles. I basically had sprinkles everywhere and had to shake them off me. When I got home later I realized that a bunch had gone down my bra, haha. Neon sign at the end of the museum. There is also a gift shop by the museum exit and there are a lot of cute ice cream themed knick knacks and clothing. 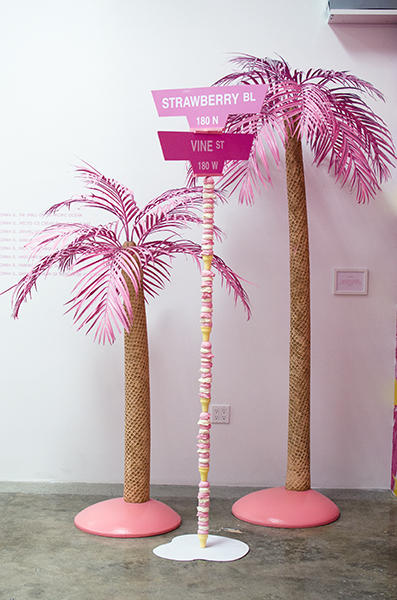 I didn’t post photos of all the rooms in the Museum of Ice Cream as I’d like to keep some element of surprise for people who have yet to go. But I definitely recommend it if you love cute, quirky interesting artwork. And of course if you love ice cream. 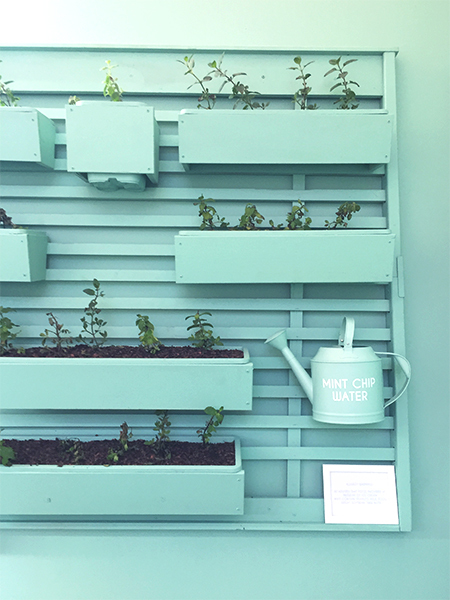 Not sure if this museum will travel to other cities, but it’s already been in New York and LA now, so who knows? 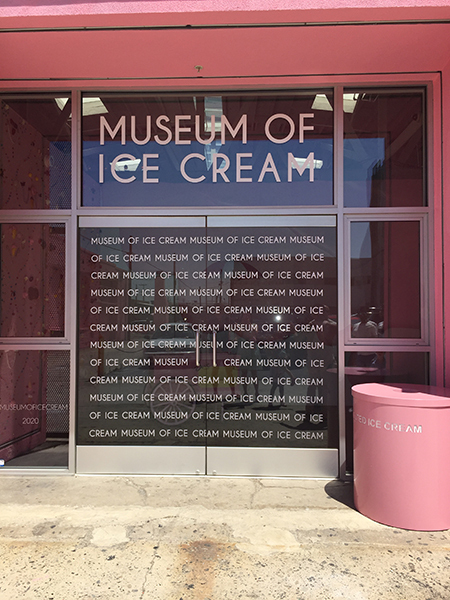 Unfortunately, tickets for the Museum of Ice Cream Los Angeles are completely sold out until July. However, more tickets may be released, so keep checking the website or sign up for their mailing list to be notified when additional tickets may be available. If you’ve been on Instagram in the past few weeks, you’ve probably seen a dessert that went viral. 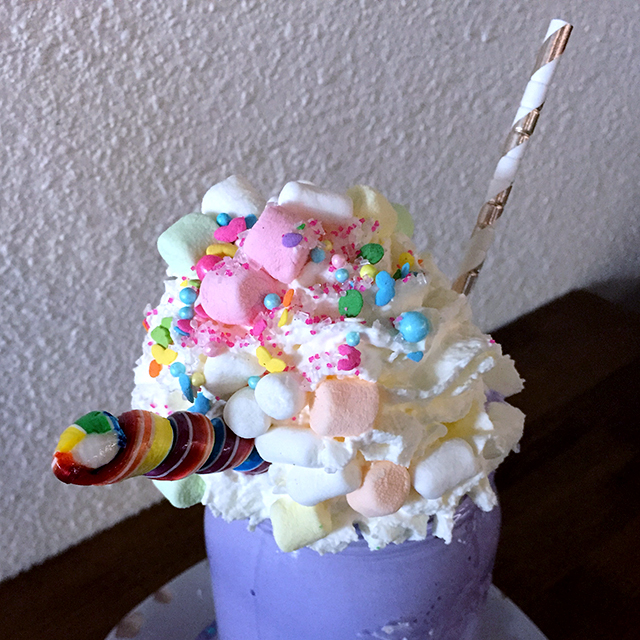 The unicorn hot chocolate (and its frozen counterpart, the unicorn milkshake) is from a cafe called Creme and Sugar. 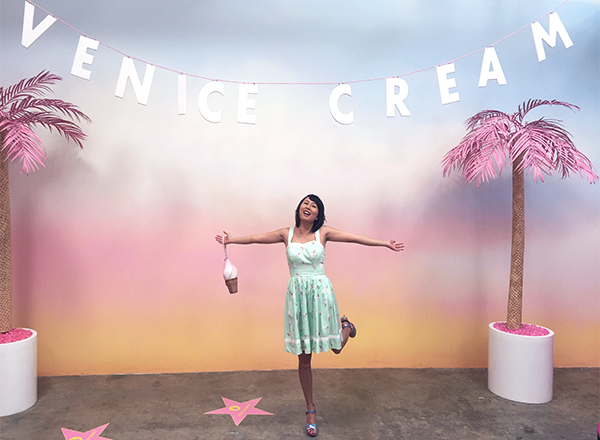 I love anything sweet and pastel colored and luckily, Creme and Sugar is in nearby Anaheim. Last week some friends and I went to check out their “secret” unicorn menu. Parking was easy in a giant surface lot. We got there around noon and the cafe itself is small on the inside, but there were couple tables and a coffee table/sofa area. When we came in, there were only two people ahead of us in the ordering line. That was just lucky on our part, as the line got crazy long a little after we ordered. This is the chalkboard mural that’s by the front entrance. Creme and Sugar has the usual stuff you would find in a cafe, such as hot/iced coffee drinks, tea, and assorted pastries. Also, they also serve ice cream from Fosselman’s, which they use for their milkshakes. The decor is vintage inspired/shabby chic. They have a cute chalkboard drawing of a unicorn by the front door. 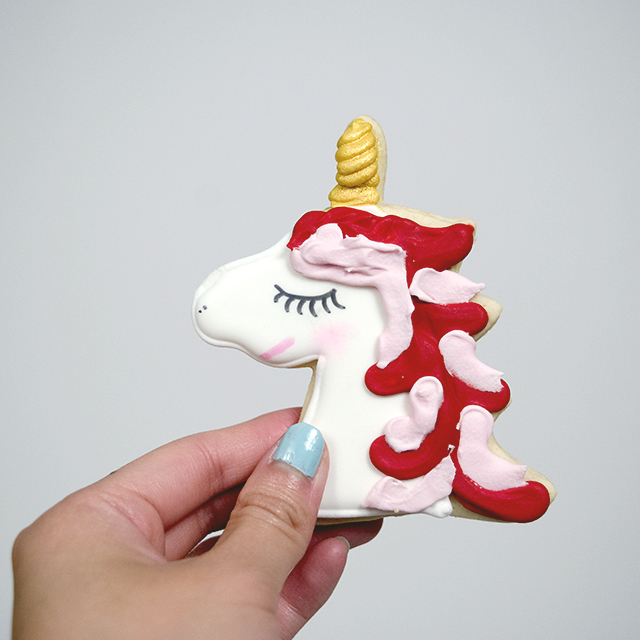 I got a unicorn milkshake, slice of unicorn cake and a unicorn sugar cookie. 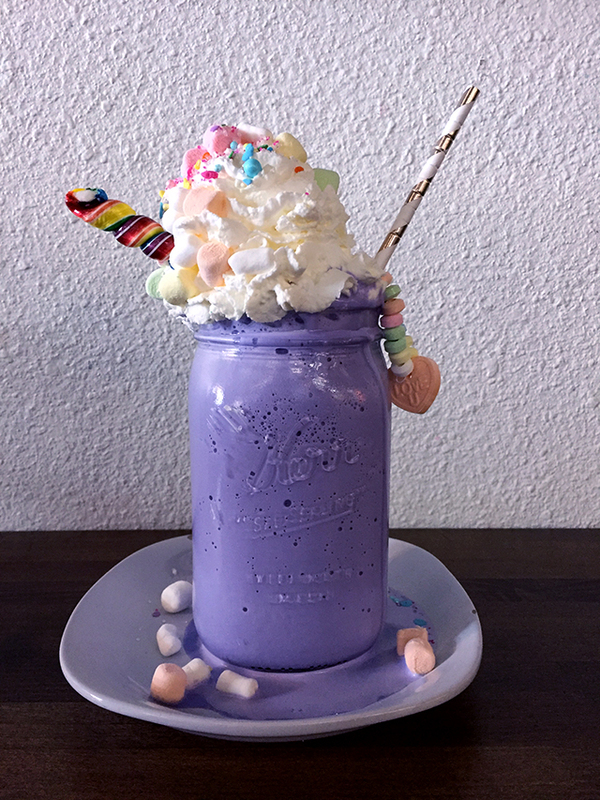 Creme and Sugar makes their unicorn shake with cotton candy flavored ice cream, giving the shake its pastel lavender color. 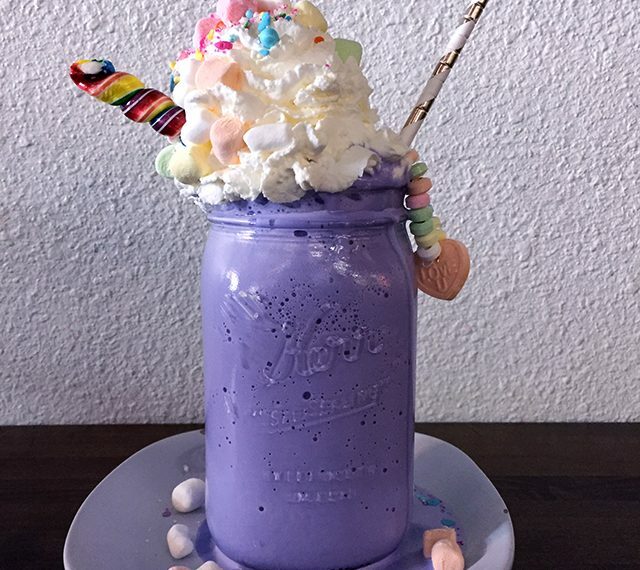 They top it with whipped cream, a special blend of sprinkles (jimmies, colored sugar, sugar pearls), marshmallows, a rainbow swirl lollipop (for the unicorn “horn”) and a candy bracelet, with a metallic gold striped paper straw. I noticed some other people’s milkshakes came with a rainbow sour belt but mine didn’t. They serve it on a plate to catch the dripping ice cream and random sprinkles/marshmallows that spilled off the shake. 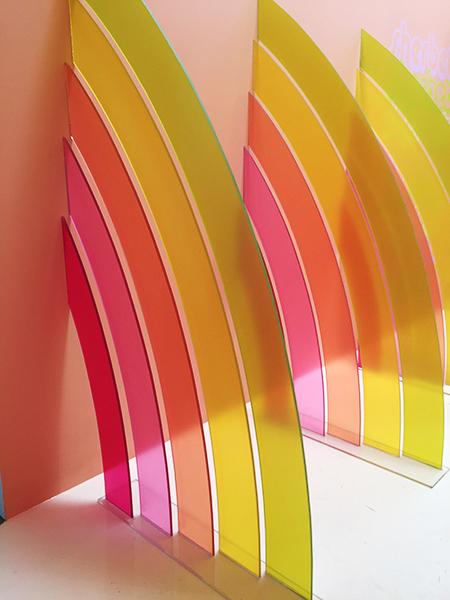 The presentation is quite cute and pretty much made for Instagram/social media. The shake came in one of those 32 ounce glass mason jars, and let me tell you- it is tough to finish a milkshake that big. I recommend sharing with friends, but I had this all to myself as one friend got her own milkshake and another only got cake. The cotton candy ice cream was not super sweet at first like I thought it would be, but a third of the way through the milkshake I had to stop and ask for a to-go cup. It was just too much liquid and way too much sugar, especially since I just came from a full meal at brunch. I took the rest of it home and finished it later. I would have preferred a smaller amount (like 12 or 16 oz) but that probably wouldn’t have looked as impressive. Would I order it again? Yes, but I would share it with a few people! Continuing with the pastel unicorn theme, the unicorn cake is made of layers of white cake dyed to be light pink, sky blue and pastel purple. There was light yellow buttercream between the cake layers. 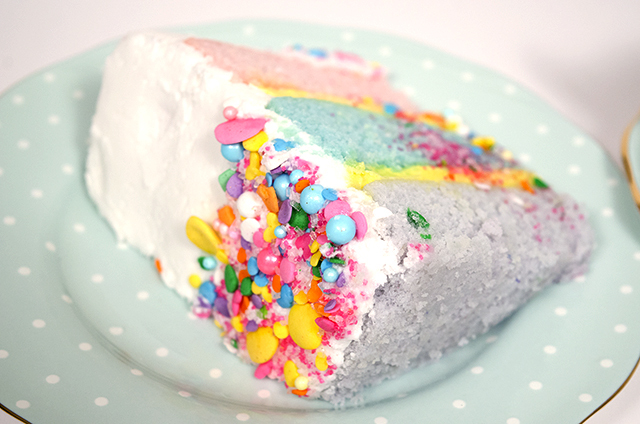 The unicorn cake is covered with a thick, very sweet, pure white American-style buttercream frosting. The sweetness of the frosting was a little overwhelming and I didn’t eat all of it, as I’m particular about my frosting not being too sweet. I did eat all of the cake part. It was moist and fluffy, with a tender crumb. Not dry at all. Because I got only a slice and not an entire cake, there was less of the special sprinkle blend on the frosting. It was still really cute though. 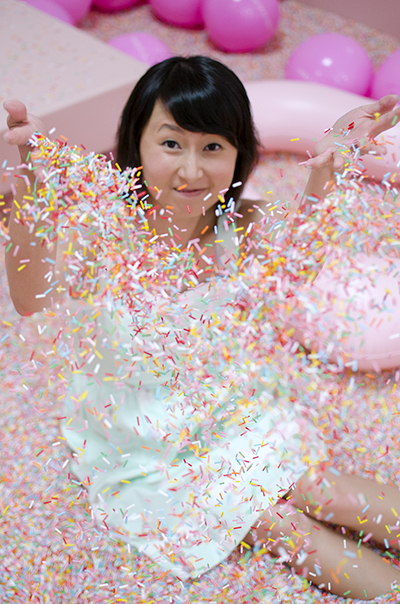 It reminded me of the sprinkle blends from Sweetapolita, with the varying textures and sizes of the different sprinkles. The shimmery sky blue large sugar pearls are so pretty! This was a typical rolled sugar cookie decorated with royal icing. The cookie was chewy, which is my favorite consistency for cookies (I’m not a fan of crisp or thin cookies). The royal icing decorating was flawless, with no bumps or bubbles. 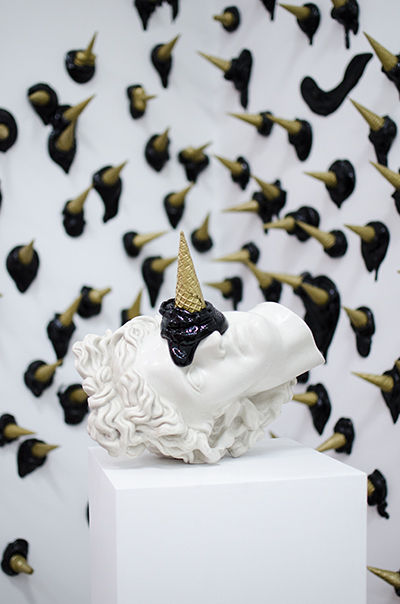 The horn was decorated in a shimmery gold icing, which was a nice touch. Additionally, Creme and Sugar also serves unicorn hot chocolate and unicorn candy bark. Of the three items I tried, I liked the cake the best. 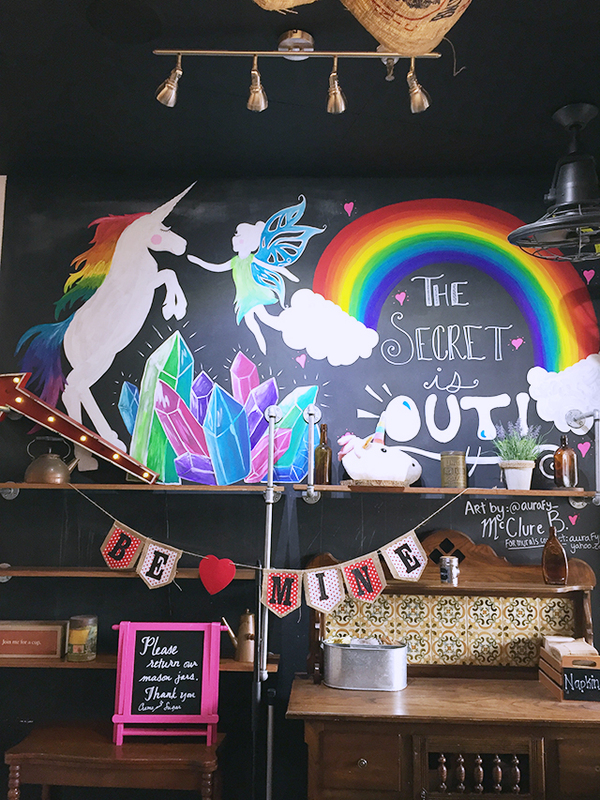 I may have to go back and try the unicorn hot chocolate! What do you guys think about desserts like these? Does the spectacle of all the over-the-top decoration make the desserts seem more enticing to you? Ross and I are always up for trying new ice cream. 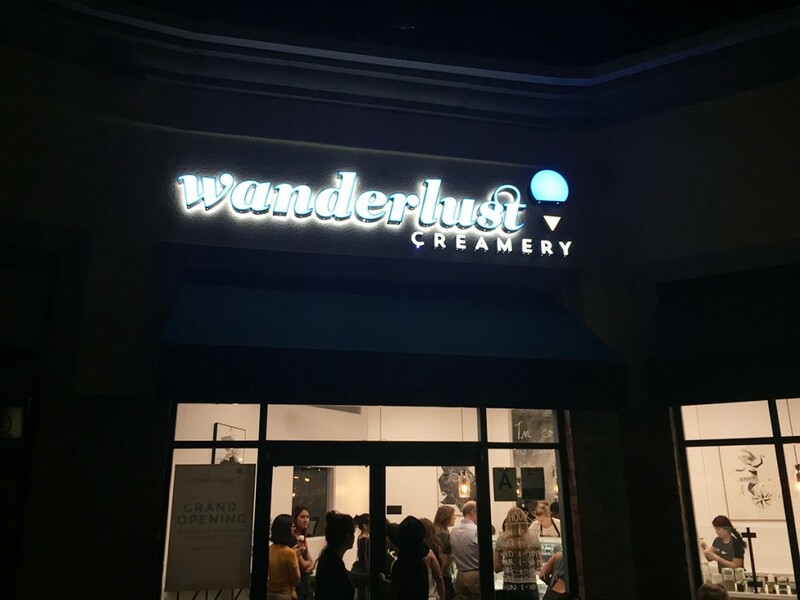 We recently went to a new gourmet ice cream place way up in the Valley (in Tarzana, to be precise) called Wanderlust Creamery. I found them through their Instagram account and their unique ice cream flavors based on different regions of the world sounded really delicious. Also, they’re one of the few places I’ve seen that offers different flavored waffle cones besides the traditional waffle cones most places have. Green tea waffle cone?! Sounds great. The parking lot was crowded but there is plenty of street parking as well. The line was long but it had only been open a few weeks when we went. 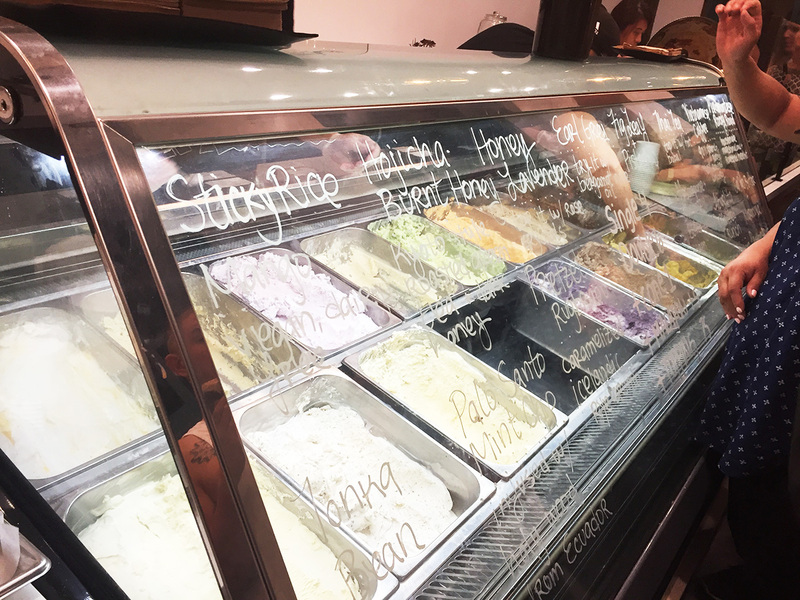 I think this part of LA doesn’t have many upscale, gourmet ice cream/dessert shops compared to say, central or West LA so a place like this is in very much in demand in the Valley. You can see the menu on their website and they rotate flavors. 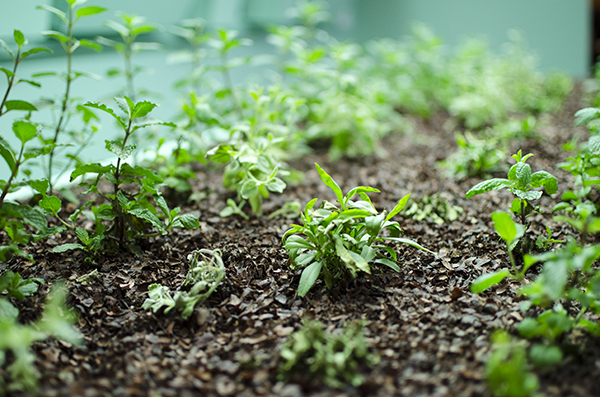 They also have a ton of different toppings that they make in house. 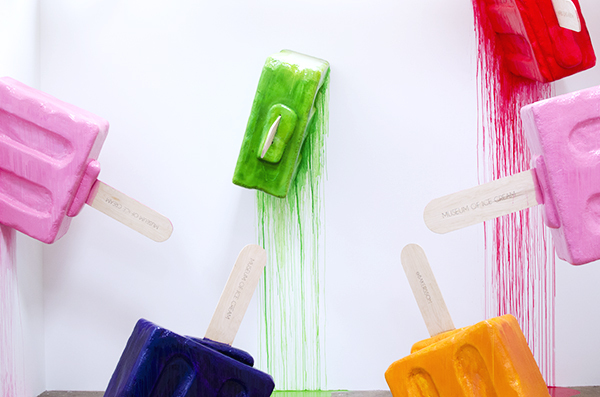 It’s not just sprinkles and whipped cream. They have honey boba, homemade strawberry shortcake crumble, pandan flavored rice crispies, and so much more. 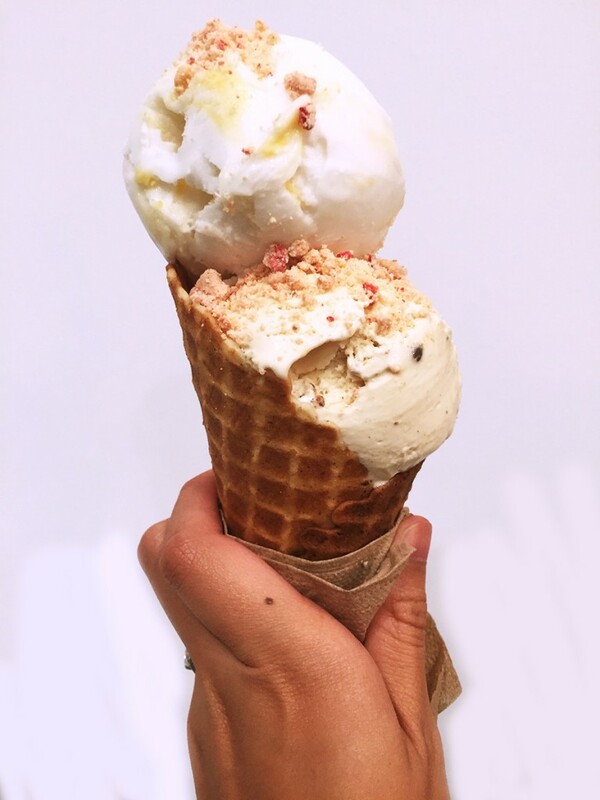 I got two scoops, one of Pretzel + Rúgbrauð and one scoop of Sticky Rice + Mango, in a brown butter vanilla waffle cone, with strawberry shortcake crumble. Pretzel + Rúgbrauð (bottom scoop): This was incredibly good, with a satisfying mix of textures. I am a big fan of ice cream with chunks or mix-ins (cookie dough, fruit chunks, you get the idea). It was reminded me of a salted caramel pretzel flavor I’ve had from other ice cream shops. The ice cream base itself was smooth and creamy, with liberal amounts of salty, crunchy pretzel bits. It also had caramelized crumbles of rúgbrauð, which is a type of Icelandic rye bread. The rúgbrauð crumble was really good and makes me want to try eating the actual bread. The ice cream base was not too sweet, but had a subtle saltiness that was accented by the pretzels and bread pieces. Sticky Rice + Mango (vegan, top scoop): This was more straight forward. It’s based on a dessert you can get in almost any Thai restaurant. There was a mango swirl in the ice cream and it tasted like fresh mango puree, but I wish it had more mango in it instead of being mostly sweet cream with a few mango swirls. It was still really tasty though. The waffle cone was freshly made (I watched them make the cones!) and it had a stronger depth of vanilla flavor than regular waffle cones. The strawberry shortcake crumble tasted just like the coating from the classic Good Humor strawberry shortcake ice cream bars (which I LOVE). While Wanderlust Creamery is too far for me to indulge in regularly (it was about a 35 minute drive with no traffic), if I’m ever up in that part of the Valley, I would definitely come back again. My husband and I both grew up on the East Coast (suburbs of Philadelphia for him, suburbs of Washington, DC for me). We live in Los Angeles now but go back home several times a year. We’re at the age now where everyone we know is getting married, so the visits home have been more frequent the past few years for all the weddings. A few weekends ago we flew back to Ross’s hometown of Doylestown, a sleepy and picturesque suburb of Philadelphia, for his friend’s wedding. Doylestown is very idyllic and much more rural than from where I grew up. It’s a very old town with beautiful homes (some from the 18th and 19th centuries), with a cute downtown area with lots of restaurants. 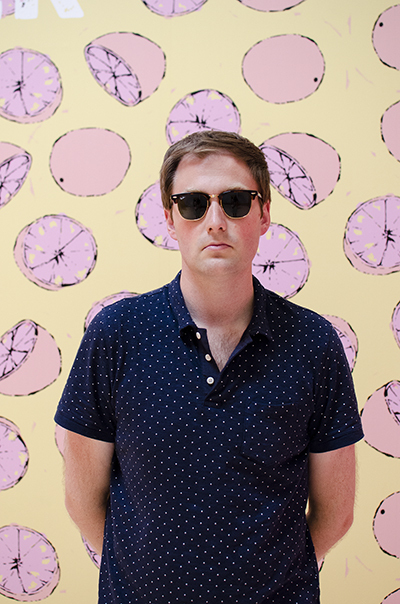 Ross had some free time before he had to go to set for the last day of shooting on the film, so we went to a few places I love in the San Gabriel Valley. The SGV is a region in Los Angeles County that is known for its Asian population and concentration of good and affordable Asian restaurants. You can find restaurants representing the different cuisines of China, Vietnam, Korea, and so on. But the SGV has a LOT of Chinese and Vietnamese restaurants, so much so that there are restaurants specializing in specific regional cuisine such as Sichuan, Cantonese, or the typical Americanized Chinese food. 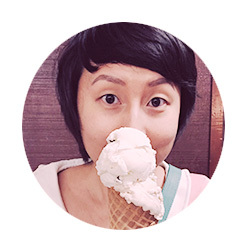 I love ice cream and different variations of it, and food mashups have been a big thing the past few years. 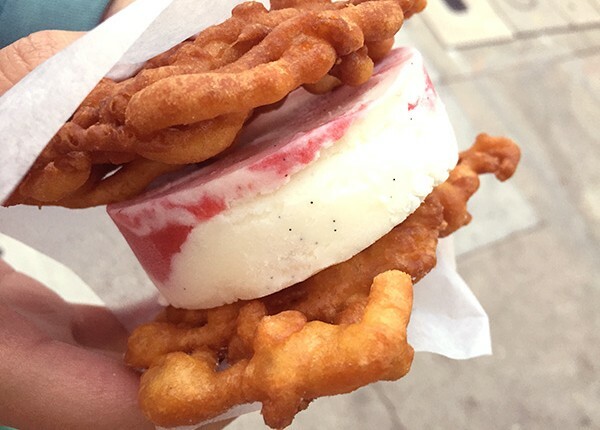 Traditional ice cream sandwiches made with cookies have been around forever, so why not substitute cookies with discs of sugary fried dough? 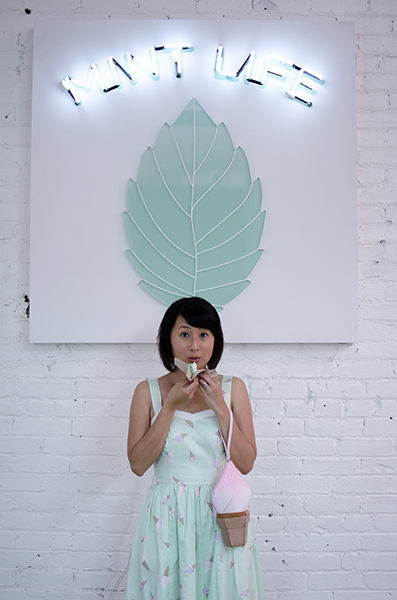 Two dessert shops in LA put their own twist on the ice cream sandwich, and I tried both!